This post is the second in our series of articles about sourcing local produce for school lunch programs. Determining how to get locally farmed products to the school is often the biggest challenge faced by foodservice staff when instituting a farm to school program. The most frequent issue cited by school foodservice staff when developing a farm to school program is difficulty transporting locally farmed products to the school. A number of factors should be considered when determining the most effective distribution method for your district, such as the district size, whether the district has centralized versus satellite kitchens, the schools’ storage capacities, and whether farm cooperatives exist in the area. Four distribution methods are outlined below. Buy directly from individual farmers. Some school foodservice directors have built relationships with individual farmers and buy directly from them. Buy from a farmer cooperative. A cooperative consolidates multiple farmers’ products and distributes them together. Buy from farmers’ markets. This model is similar to buying directly from farmers, but orders are given to the farmers a few days prior to the farmers’ market and are picked up by the foodservice staff on the day of the farmers’ market. 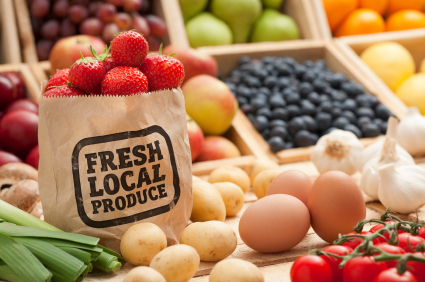 Order locally grown food through a traditional wholesaler. For this method, foodservice staff purchases from a distributor that offers at least some local products. Because of the differences among school districts, there is not a one-size-fits-all or recommended distribution method. Each district, after taking an inventory of their resources and unique circumstances, can choose the distribution method that best fits their situation. For more extensive information on distribution models, see the USDA’s publication Eat Smart – Farm Fresh! A Guide to Buying and Serving Locally-Grown Produce in School Meals. This post serves as an introduction to our series of articles about sourcing local produce for school lunch programs. Your school system already utilizes sustainable practices when constructing and operating new schools. As a foodservice director you may have considered additional steps you can take to support the sustainability effort. Why not adopt a program such as buying local produce for your school lunch program (i.e., farm to school program)? A successful farm to school program partners schools with local farms and results in more nutritious and better tasting menu offerings, which in turn can increase school meal participation rates and contribute to the overall health of your students. In addition, purchasing directly from nearby farms supports the local economy and provides health and nutrition educational opportunities for students. All of these benefits sound great, but where should you start and what hurdles might you encounter? Many resources are available to assist school foodservice directors with sourcing local produce for their lunch program. The Farm-to-School Program is a valuable national network that connects schools with local farms. Farm-to-School provides myriad resources to help school foodservice directors get started. The Farm-to-School website provides information about building relationships with local growers, case studies from school systems that have already implemented farm to school programs, and tools for evaluating the program’s success. I highly recommend reading USDA Farm to School Team 2010 Summary Report. This report summarizes the findings from fifteen school districts across the country that have already implemented a successful program – describing challenges encountered, along with real-world solutions. You may be interested to learn how various school districts overcame funding shortfalls, labor challenges, and facility modifications that are required to implement a farm to school program. The amount of valuable information and the number of ideas and solutions available to anyone interested in starting a farm to school program are incredible. Consider investing time researching the opportunity and take advantage of the resources that are available to you through the Farm-to-School program. The potential positive impact of a farm to school program for your school system is enormous. Good luck, and stay tuned for additional posts about this topic!